We believe that everybody should be able to proudly show off their brews in an elegant, stunning, and flexible manner. To this end, we've designed RaspberryPints from the ground up with the homebrewer in mind. Our goal is to provide a high-quality digital taplist solution, hosted on consumer-level hardware. We provide our software free of charge, complete with step-by-step instructions written for the digital novice. What are you waiting for? Head over to the Build Your Own! section to get started. Probably less than you think! The RaspberryPints system was designed to strike a balance between cost and features. Here's a list of the basic hardware you will need to buy. Some users will already have things like the video display and cables so their cost will be less. The RaspberryPints system has just about everything you can think of. If you own a kegerator then RaspberryPints is for you. How many times do you have to explain exactly what the beer in each keg tastes like? Answering the same questions over and over. Why not build RaspberryPints and have descriptions of all of your beers on a nice big (you determine how big) screen? 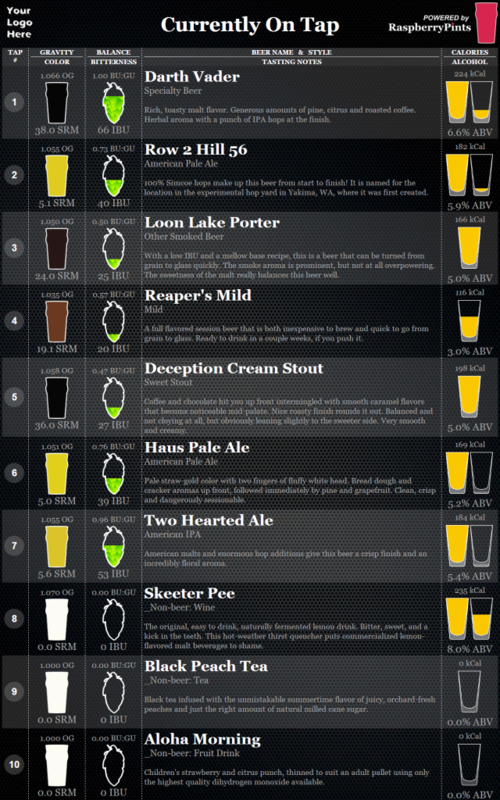 Not only a description of each beer on tap but the ABV%, the IBU's too. Read all about additional features on the features page.